President Barack Obama stands on stage after addressing the Democratic National Convention in Charlotte, N.C.
President Barack Obama’s fall mission: Remind voters why they chose him in the first place, hope the economy doesn’t get worse — and paint Mitt Romney as an unacceptable alternative. “On every issue, the choice you face won’t be just between two candidates or two parties. 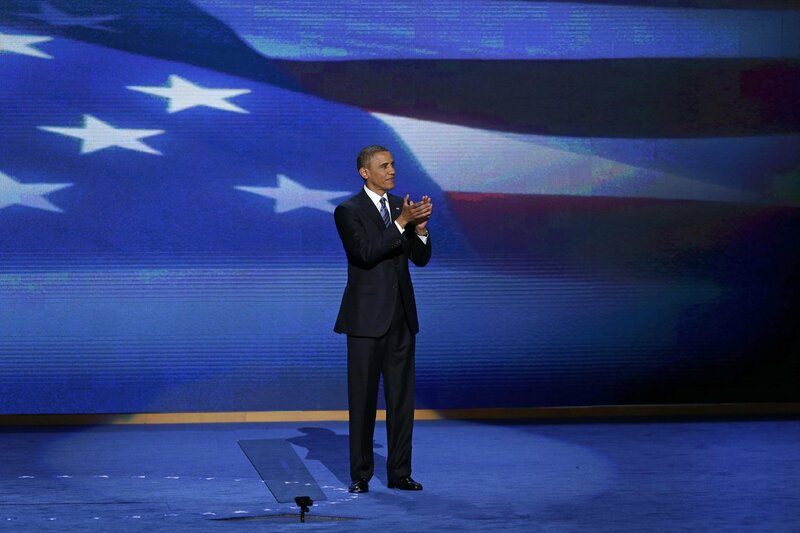 It will be a choice between two different paths for America,” the Democrat said as he accepted his party’s nomination. His re-election is far from certain and his task is far from easy, despite the built-in advantages of incumbency. In a sharp reminder of that, his administration was releasing its August jobs report early Friday, offering the latest snapshot on whether the country’s 8.3 percent unemployment rate was improving. No president since Franklin D. Roosevelt has been re-elected with a jobless rate higher than 8 percent. Over the next 10 weeks, Obama — the country’s first black president — will push to make history again. In ads and speeches, he’ll try to do it by casting the campaign as a choice: give his economic policies more time to flourish or bet on Romney’s agenda that the president says would simply benefit the wealthy at the expense of the middle class. Polls show a close race, and Republicans and Democrats alike expect that to be the case until November, barring some surprise. Nearly a quarter of voters say they haven’t decided on a candidate or could still change their mind, meaning Obama’s focus will be two-fold: fire up his base without alienating unaligned, independent voters. That will be the goal when he and Romney face off in a series of high-stakes October debates. For now, the contest centers on the seven states where surveys show neither side has a significant advantage: Colorado, Florida, Iowa, Ohio, Nevada, New Hampshire and Virginia. Obama won them all four years ago, and he’s banking on his expansive voter registration and get-out-the-vote operation — bolstered by information technology and social media — to make up for Romney and his Republican allies’ significant cash advantage on TV. Obama has some ground to make up in North Carolina, where he held his convention. “It’s a turnout election. We’ve got to make sure the people who support the president’s plan are participating,” said David Leland, a former Ohio Democratic party chairman. Democrats argue that the election will come down to three states: Ohio, Florida and Virginia. Of those, Democrats are most optimistic about Ohio, where the economy is improving and the auto bailout is popular. In Virginia, they’re hopeful that minorities will turn out in force again as they did four years go. Florida is the one that makes Democrats the most nervous. To tip the balance in those states and others, Obama’s team will offer anew a steady string of warnings about Romney. “We’re going to be aggressive about telling the story of this administration, telling the truth about what this president has accomplished, but also telling the truth about Mitt Romney’s plans and what they would do to this country,” said deputy campaign manager Stephanie Cutter. The president has questioned Romney’s commitment to Americans earning modest salaries, raising suspicions about the Republican’s background as a co-founder of a private equity firm. When Romney chose Wisconsin Rep. Paul Ryan as his running mate, Obama said it sealed a longstanding alliance between Romney and congressional Republicans whom Democrats accuse of threatening Medicare, education and spending priorities. Democrats also will continue defining Romney’s business background in a negative light. Since Romney locked up the nomination in April, Obama’s team has tried to portray him as a ruthless businessman to a public whom they argue has been hardened by the near economic collapse of 2008. Obama’s campaign has pressed Romney to release several years’ worth of tax returns, noting that returns he did release showed the ownership of a Swiss bank account and investments in the Cayman Islands, home to common tax shelters. At rallies, the president portrays Romney as someone who would ram through tax cuts for the super wealthy at the expense of the middle class. And Obama’s allies have cast Romney as an outsourcer of jobs. “The Obama people have been very successful in introducing a counter narrative to Romney. I think a lot of it has stuck,” said Tad Devine, a former adviser to John Kerry’s 2004 presidential bid who is not affiliated with Obama’s campaign. To press that case, Obama will frequently deploy his chief attack dog, Vice President Joe Biden, and his attack dog emeritus, former President Bill Clinton. Both will spend the next two months ripping into Romney, and traveling extensively in states where they can help boost the president’s standing with white working-class voters, including Ohio, Pennsylvania and Virginia. Obama also will dispatch his popular wife, Michelle Obama, to key states as he looks to remind voters of why many voted for him in the past — they like him — and assure them that he can relate to the struggles they face. With a race this tight, Obama himself isn’t likely to let up on Romney. Expect to hear the president draw stark differences with the Republican on issues important to Obama’s core constituencies by emphasizing his first-term successes as he looks to win support at the margins. He announced his support for gay marriage, motivating many young supporters, and made his case to college students that he would fight tooth-and-nail with Congress to keep student loan rates low. When the Supreme Court upheld his sweeping health care reform law, he warned supporters that Romney would work with Congress to dismantle it. Eyeing the growing clout of Latino voters, Obama used his executive powers to prevent certain immigrants from being deported and making them eligible for work permits. And with Rust Belt voters in mind, the president talks about the need to end tax breaks for companies that ship jobs overseas, an obvious attempt to highlight allegations of outsourcing against Romney. There are some things Obama can’t do anything about. After the government issues its jobs status report Friday, it will do so again on Oct. 5. The final jobs report before the election will arrive on Nov. 2 — just four days before Election Day. Have to wonder why Obama’s campaign would trot out the signer of NAFTA in an election focused on the economy. A lot of people remember the Clinton years as boom years, but that was due to the rise of the Internet, which subsequently busted soon after Clinton left office. Bill worked hand in hand with Newt Gingrich at the helm of Congress to turn “that sucking sound” Ross Perot talked about into a “raging waterfall” of jobs going out of our country. You can expect the jobs report to falsll show unemployment below 8%. The Obama administration will manipulate the numbers and lie. Real unemployment which should include those no longer eligible for benefits is over 15% underemployment is even worse.